Following up on a study in which Smartvid.io’s artificial intelligence engine “Vinnie” learned from contractor Suffolk's data to predict roughly one in five safety incidents with 81% accuracy, nine major construction firms are partnering with the software company to further develop predictive analytics and therefore prevent incidents and reduce risk across the industry, according to a Smartvid announcement from CEO and Founder Josh Kanner. 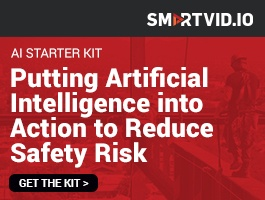 A case study by Suffolk Construction and image-analysis firm Smartvid.io shows how machine-learning algorithms can improve safety and reduce risk has spurred the creation of the Predictive Analytics Strategic Council, an initiative by 10 major construction companies to share project data for A.I.-driven analysis. While it has made great strides in getting contractors and other members of project teams to load information into its BIM 360 program, Autodesk has acknowledged that its sometimes hard to get actionable information out of these systems. Dense documentation can provide some insights when pored over at a later date, but knowing what problems need addressing at the morning meeting based on yesterday’s open issues list can be a daunting task.